Are you guys ready to designate Coinexx as a Trusted Broker? Coinexx was first brought to our attention by SmallPaul in June 2018, and it was addded to our List a few days later. HERE on the LINKS page, you can review the original comments regarding Coinexx (from June 2018 forward) which were posted in this thread. The Links page has not been updated for 3 months (since October 11), so the most recent comments regarding Coinexx do not appear on that page. My apologies for that. It’s a chore to keep the Links page up to date, but I’ll attend to that chore as soon as I get a Round Tuit. Your comments are requested – pro and con – regarding the Trusted Broker designation for Coinexx. I love their “blend” of account currencies both Fiat and Crypto. credit to account) and out via Crypto… so… What’s not to love? maintenance. I’d upload a “Heart” icon but you get the idea !.. [EDIT2] I guess the answer to the question "What’s not to love?" considering the super low commissions. Well I think its safe to say Capital City markets Has bite the dust. Some of us have lost thousands. I don’t know if their is any recourse but we will check it out. Support was good at first, but I have recently had a few issues go unanswered with zero responses. Their chat support appears to be separate from their technical support, which could be the problem, as these issues were raised with them and supposed to be relayed. The most recent bug that I reported a week ago still has not been addressed and the nature of the bug is somewhat disconcerting. If you look at U30USD on demo account, on the 1-minute time frame, you will see what I am talking about. Maybe someone that is more knowledgeable can explain how it could be happening since demo is supposed to mirror live and what I am seeing raises some potentially troubling questions. Yes for the comm, execution reliability n spreads they offer and for how they handled ex-finpro clients with TLC . And i transfer funds in/out pretty often and there hasnt been any issues so far. yes it is. they usually raise a ticket to their tech support for issues that cannot be solved on chat & then either my poc or their support team replies. Never had a situation where it was unanswered but did experience slight delay in the beginning. @Clint yes i think we should have them as a trusted broker ! this, and whether it is a truly unique approach. This seems like an approach other brokers should emulate?.. Edit: biggest pro is that most of us (myself included) have traded with Coinexx without issue to date. I read about this also months back and found it very interesting. Good stuff! From what I gather, no fiat ever changes hands. If you want EUR/USD, they provide EUR/BTC * BTC/USD . This amounts to the same thing. How they protect against volatility when holding fiat accounts is another question altogether and I haven’t seen this question addressed. Maybe they use some kind of tether on the Stellar network or similar, but now I am just speculating. It’s time to remove Evolve Markets (SVG) from our List. Beginning in September 2018, Evolve stopped accepting new U.S. clients, making that broker ineligible to be on our List. We have patiently waited for Evolve to settle their issues with the Nanny State – but, no such luck. 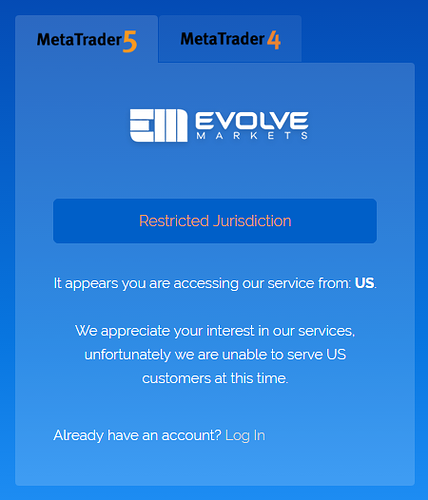 As of today, Evolve Markets still excludes U.S. residents. Maybe just wait a while on Evolve.Markets status. can decide to accept excluded categories based on "non public"
through a private application, I think. Based on my limited understanding, so please correct me if I am wrong, the demo should be a direct, read-only feed of the live trading. Any more sophistication than that seems unnecessary to me. For a broker to say that they do not guarantee that the demo price action will exactly match the live leaves me to assume that the meaning behind that statement has more to do with the subtle delays that may occur in an effort to transmit data that has already occurred. Presumably, the feed for each trading pair would be achieved through some cookie-cutter programming, so seeing a single pair behaving this way while also considering the nature of the issue, begs to question what is being done to cause this issue while also leaving to question why something so seemingly easy to fix has not been addressed yet. I hope that it is clear to anyone that may be reading this that my intention is not to bash on Coinexx, as they are currently my top choice, but only to bring these matters to discussion for the sake of transparency and so that we can all benefit from the knowledge that is shared. I would not want to simply disregard any issue even if I personally felt that it was trivial due to the fact that there may be many things going on behind the scenes that I just do not understand or that I am aware of. Presumably, in a similar manner to how some crypto exchanges can offer margin trading for products that are ‘pegged’ to real currencies (see Bitmex, as an example), in the form of CFD’s, where you are not actually trading the underlying asset. Even more easily achieved by a broker because they could claim that they are not actually holding anything, but merely serving as a go-between. This, all, assuming that I am understanding you correctly. The troubling part of the article is the presumption that conducting business in this manner will allow them to operate as a self-regulated entity while also satisfying all regulatory requirements and compliances. Even if that were true to the jurisdiction in which they operate, we all know how the long-arm reach of US regulatory bodies can sometimes know no bounds. We also know that simply passing legislation that defines anything as something else is all that would be needed to justify their claims that you are breaking their laws in an effort to satisfy any Memorandum agreements. That does not even touch surface to the probable lobbying that is going on, taking the shape of legal bribery, but I am getting off-topic. The concept is not new, based on my very limited understanding. I am certainly not smart enough to understand it, but I think that is by design. limit or generally not care as much about Demo system performance. Almost all Demo accounts are poor representations of the real thing. Again, I can’t say with Coinexx. and thus be wildly incorrect. As a programmer, I would think your description would be the easiest way to do it. In practice, I have seen demo feeds that are way off and seen this on many different brokers. Your mileage will vary. I am not talking about Coinexx in particular. I haven’t examined their demo feed in depth. They might be better than most, but I wouldn’t expect it to be the same. It cannot be. Even if they are very close, as Hyperscalper said, execution will differ. Demo is a Sandbox, to use IT lingo. For serious Staging Environment, minimum risk on live feed is the way to go IMO. Could you post some links to that, please?